ARLINGTON, Va. — The Volvo XC40, a new small SUV for 2019, earns a Top Safety Pick+ award from the Insurance Institute for Highway Safety when equipped with optional curve-adaptive headlights. 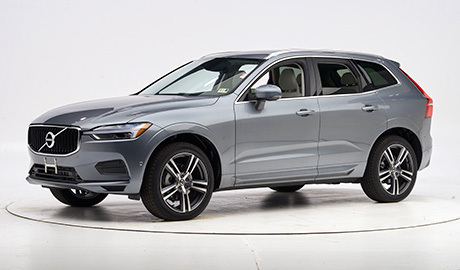 The larger 2019 Volvo XC60 earns the Top Safety Pick award when equipped with curve-adaptive headlights. Both the XC40 and XC60 earn good crashworthiness ratings across the board, and both SUVs come with standard superior-rated front crash prevention systems. In IIHS track tests at 12 mph and 25 mph, both the XC40 and XC60 avoided collisions. Each model's forward collision warning component meets the criteria set by the National Highway Traffic Safety Administration. The XC40 earns a good rating for its curve-adaptive LED reflector headlights, which come with the optional Advanced package. The XC40's base headlights — static LED reflectors — earn a poor rating, due largely to excessive glare from the low beams. The XC60's optional curve-adaptive LED reflector headlights earn an acceptable rating, which is why the midsize luxury SUV earns a Top Safety Pick award and not a Top Safety Pick+. The XC60's base headlights — also static LED reflectors — earn only a marginal rating because they provide inadequate visibility in multiple test scenarios. 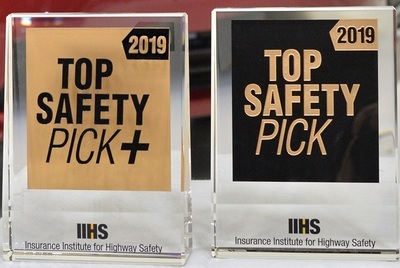 The two SUVs are the first models from Volvo to earn 2019 safety awards.